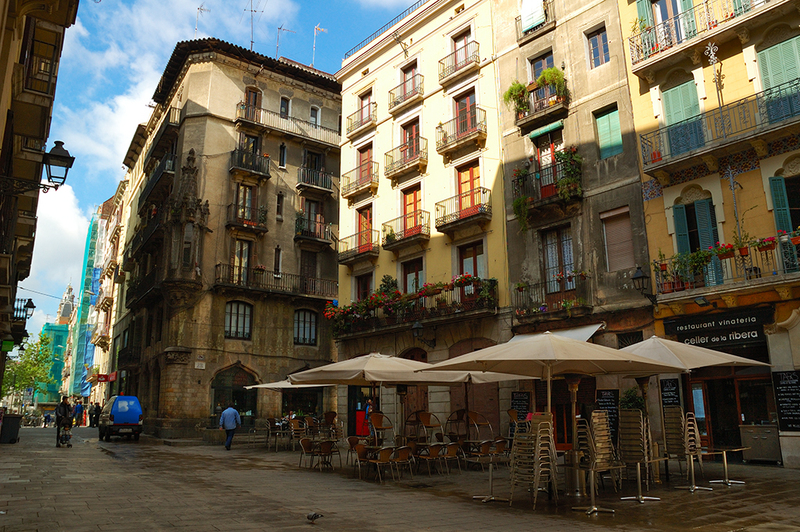 In the old part of town, Barcelona can boast of several squares with this atmosphere of intimacy only given by the very architecture, by the space in between buildings. I mean, behind the next corner you may find a hidden spot with no sidewalks, few trees...sort of esplanades with terrace chairs and a fountain at most. In those places you certainly travel in time and in that sense you are just another old villager, part of the historical settings, part of the scene. A good example is Plaça de les Olles at Barri de La Ribera in the center of El Born. I am not fond of making gratuitous publicity but a few exceptions when it comes to recommending places to visit or enjoy the local food do help. As it happens to be in the picture here is a link to an interesting place to have tapas and taste some excellent wine: El Celler de La Ribera. At least the terrace well deserves spending a buck or two. This photograph will probably push Barcelona into being my next European destination. I have rented an apartment for a four night stay in the Born zone of Barcelona. Was looking for informati0n regarding the small placa where the apt. is located, and your photo came up on the search. Our apartment building is in this picture and I am more excited than ever to experience that which you have captured so beautifully through a lens. Thank you for sharing.